Octoberween continues! 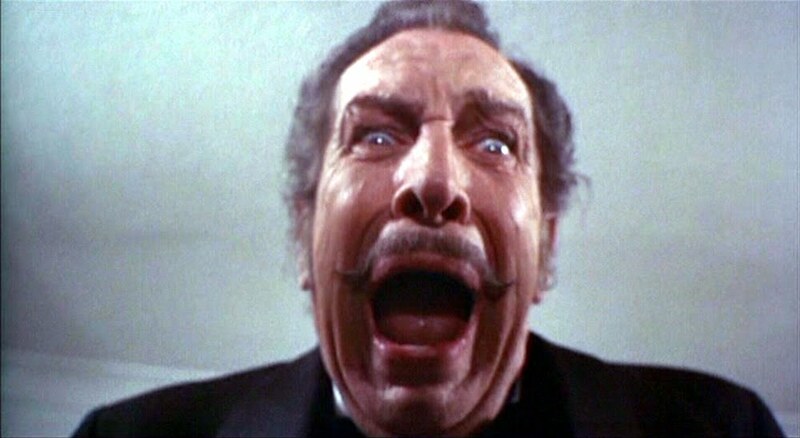 And with it, so does my undying love of Vincent Price. I cannot think of a single more spooktacular way to spend this month, than by marathon-ing the films of this master of the macabre, highness of the horrific, sultan of the scary, Kaiser of the creepy, tycoon of the terrible, rajah of the repulsive, pharaoh of the frightening, and so on. Meh… I tried, anyway. The Plot: Several years after the gruesome decapitation of his wife at the screening of one of his films, horror movie icon Paul Toombes (Vincent Price) is cajoled into reviving his most (in)famous character: Dr. Death. Of course, things get tricky, and the unsolved murder of Mrs. Toombes returns to the public eye when Dr. Death himself is implicated in a series of grisly murders. Apparently being framed, Toombes turns to his best friend and writer Herbert Flay (Peter Cushing) to help him solve the mystery, and discover the real reason why this fictional character just won’t leave him alone. Right off the bat, let’s clear one thing up: Madhouse is completely the wrong title for this movie. No one ever goes anywhere near an asylum, there’s no heavy imagery or appropriate symbolism, although mental illness is discussed from time to time. I cannot explain the title except that this is a low-budget Vincent Price movie from the mid-seventies, and someone high up on the food chain probably just wanted to make a movie with that title. Welcome to off-Hollywood indie British horror, kid. This is just the way the world works. You want to stay afloat in this business, you’ve got to give them a catchy title, one that sends chills up the spine. Something like… Madhouse. Yeah. I like that. Drop that whole “Dr. Death” thing. That doesn’t make any sense anyway. The mystery itself is, frankly, fairly predictable, but with a few solid attempts at misdirection. Even though the astute viewer will rule it out almost instantaneously, Toombes becomes obsessed with the theory that he committed the murders unwittingly, having become fully consumed by the character of Dr. Death, psychologically transforming into a familiar role, a kind of accidentally self-induced split-personality disorder. While we never fully subscribe to this notion, it is great fun to watch Price contemplate the possibilities. And of course, here’s some nice commentary on one possible outcome of method acting. While Daniel Day-Lewis may never have beaten anyone to death with a bowling pin, he did text in character as Abraham Lincoln. Even used the same model of phone as the great President did back in the 1860s. You’ve gotta respect that kind of professionalism. In all seriousness, though, Toombes’ relationship to his villainous part does remind me, and I can’t help it, of Heath Ledger’s untimely demise and the role the Joker may have played in it. So yes, while the mystery is perhaps lacking, the filmmakers more than make up for it in other areas. 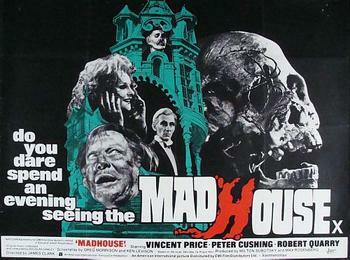 Obviously, Price and Cushing are fantastic, and I’ve spoken to the film’s social commentary, but there’s also some genuinely creepy stuff in Madhouse, mostly in the guise of one of Toombes’ old costars Faye Flay (Adrienne Corri), who went crazy after suffering disfigurement in a horrible accident, and now lives in Herbert Flay’s house, hiding away in a kind of “woman-in-the-attic” fashion. She pops up every now and then to remind Toombes of his sordid past and play with spiders. Spiders? Oh yeah, she keeps a variety of spiders. They just crawl all over her while she chitchats with Vinnie P. That’s all I ever want to see in an old forgotten associate. Devoted readers (assuming I have any) will note that this film is from the Much Ado About Murder era, a film that I can’t help but bring up as often as possible. 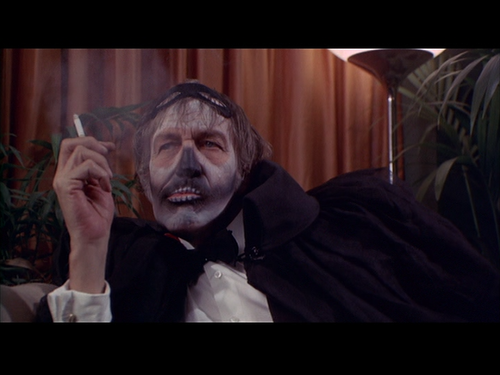 If there was ever a time when Vincent Price was not on his A-game, that time was not the 1970s. That said, it was also not the 60s or the 50s, so… or the 40s… or the 90s… and definitely not the 80s when he did The Great Mouse Detective. This dude never had an off decade. That’s awesome. Okay, I’m done now. Get back to watching horror movies.